"Great looks, great sound and great price -- what more can you ask for?" Sound "The VS70 displayed well-defined, finely scaled dynamics, with excellent delineation between small changes in volume level. Not only were dynamics painted with great detail, the shifts in volume were also fast and agile, so musical tempos moved forward with considerable momentum." "The VS70 produced a gloriously wide-open soundstage. Both depth and width were displayed in good measure, with unusually precise placement of musicians." "Some components fake detail by jacking up the treble response, but, if anything, the VS70 had a very slightly polite treble, so the detail it conveyed was genuine." Features Fully balanced 35Wpc stereo amplifier that "includes a volume control, so it doubles as a single-input integrated amp." "Each channels tube complement consists of two 12AX7s and one 6DJ8 on the bottom, and two EL34 output tubes mounted above." KT77s to replace the EL34s are an option as well. "Feeding the output transformers is a typical, proven ultralinear circuit. JE Audio describes the two feedback loops used in the circuit as a 'Patented Dual Balanced Feedback Topology (DBFT),' claimed to 'improve signal integrity and audio fidelity.' Feedback in each loop is 9dB." Use Sounds its best -- more detailed and defined -- without a preamp and with KT77 output tubes. "Break-in was drawn out considerably by the manufacturers prohibition against running the amplifier more than four hours at a time. JE Audio contends that this playing limitation is needed to prolong the life of the output tubes." "Tube life is forecast at 1500 hours. Thats not the length of time until the tubes fail, but the time stipulated until their sound starts to deteriorate." Value "At its $2200 price ($2320 with KT77 tubes), the VS70 has to be considered an outright bargain." My hi-fi journey began with a Dynaco Stereo 70 amplifier. My best buddys sisters boyfriends dad (honest!) had one that drove AR-2a speakers, so it became my first object of hi-fi lust. Sure, I was vaguely aware of companies like McIntosh and Marantz, back when those companies were run by the men whose names they bore, but I hadnt actually seen any of their gear. The 35Wpc Dynaco amp was real, something I could actually listen to. Ive seen estimates that over 300,000 Stereo 70s were sold, making it the most popular amplifier ever built. They still fetch surprisingly high prices on eBay. You can even buy new, updated kit versions today, though not for the original $99.95 USD price. The Stereo 70s physical layout has remained popular to the present time: tubes in front, transformers in back. Output tubes were EL34 pentodes, one of the sweetest-sounding tubes ever made. I owned a modified Stereo 70 for a couple of years until I traded it for some 300B single-ended-triode (SET) amps, a move I later regretted. The JE Audio VS70 ($2200) is a modern stereo power amplifier that's similar to the Dynaco Stereo 70, most notably in its use of EL34 output tubes to produce 35Wpc. However, there is also one notable difference: the Stereo 70 was a true power amp, while the VS70 includes a volume control, so it doubles as a single-input integrated amp. I confess I had never heard of Hong Kong-based JE Audio when Marc Mickelson asked if Id review the VS70, but a quick visit to the company's well-designed and informative website convinced me this company was serious about building hi-fi gear. The first thing I noticed when I unpacked the VS70 is that its quite hefty. Measuring 17 1/2"W x 6 3/8"H x 15 1/4"D and weighing in at 53 pounds, its surprisingly beefy for a relatively low-power amp. The second thing I noticed is that its flaming gorgeous. Eschewing the standard folded-steel chassis, the VS70 is constructed of thick brushed-aluminum slabs machined to give it a kind of truncated pyramid look, where the top of the chassis is slightly smaller than the bottom. Its a seriously attractive look that must be rather expensive to fabricate. Placement of the tubes in the chassis is innovative. Unlike so many medium-powered tube amps, which use the tubes-in-front, transformers-in-back arrangement pioneered by the Dynaco Stereo 70, the VS70 places both low-level and output tubes in a cavity in the center of the amp. This cavity, which functions like a chimney, is open at the bottom and top, so plenty of cooling air can flow upward and provide excellent ventilation -- a (literally) cool design. Transformers are enclosed inside the chassis. Each channels tube complement consists of two 12AX7s and one 6DJ8 on the bottom, and two EL34 output tubes mounted above so the heat from the higher-powered tubes can rise without heating up the smaller ones. All the tubes are mounted horizontally. The 12AX7s were Sovteks, the 6DJ8s were JJ's, while the EL34s were Mullards. Lest you start salivating at the idea getting the best EL34s ever made with your VS70, let me hasten to clarify that these were new-production Mullards, made in the same factory as the Sovteks. The solid-state power supply ramps up slowly for the first 60 seconds to reduce the initial current surge and to be gentle to the tubes, diodes, and filter capacitors. When you replace the output tubes, youll need to bias the new tubes. JE Audio provides innovative (that word again) bias-adjustment controls underneath the amplifier. Tube life is forecast at 1500 hours. Thats not the length of time until the tubes fail, but the time stipulated until their sound starts to deteriorate. JE Audio takes pride in using completely balanced circuitry throughout its electronics, from the input of the VL10 preamp to the output terminals of the VS70. Thats right -- even the output section of the amplifier is balanced, which youll see when you connect the speaker cables. Each tap on the output transformers is balanced, so there are separate positive and negative binding posts for each of the 8-ohm connectors and separate positive and negative binding posts for each of the 4-ohm connectors. None of the output terminals is grounded, unlike with most amplifiers. Feeding the output transformers is a typical, proven ultralinear circuit. JE Audio describes the two feedback loops used in the circuit as a "Patented Dual Balanced Feedback Topology (DBFT)," claimed to "improve signal integrity and audio fidelity." Feedback in each loop is 9dB. Premium-grade parts are used throughout the amplifier. The power supply uses a C-core filtering choke and premium capacitors. The output transformer is an M6 grain-oriented steel model from the US, and the power transformer is a R-Core model imported from Japan. Copper foil-in-oil capacitors are used for signal coupling. Input sensitivity is 1.1 volts for full output, and input impedance is 47k ohms into the unbalanced RCA inputs, or 94k ohms into the balanced XLR inputs. Any competently designed preamp or source component should have no trouble with either of those impedances. Power consumption is 205 watts at full power -- not bad for a tube amp. The signal-to-noise ratio is specified at over 85dB; however, I could hear just a tiny bit of very low-level tube rush and hum at my listening position. It was not enough to intrude on the music and barely perceptible when no music was playing. Still, I would have preferred no audible noise. Of course, the 103dB sensitive MaxxHorn speakers I use make any noise in the system quite audible; with lower-sensitivity speakers, the VS70's noise would probably go unnoticed. On the front panel of the VS70 is the large central volume control, while a green LED lets you know the amplifier is turned on. This LED blinks yellow during warm-up; then, in theory at least, it turns green and shines steadily when the amp is ready to play. In reality, the amp starts to play before the LED turns green. In the rear is a standard 15-amp IEC connector, the two sets of binding posts, and both RCA and XLR input jacks, recessed into the chassis so they dont stick out. A small switch lets you select the balanced or unbalanced inputs. You cant use both at the same time, but why would you want to? Three machined metal cylindrical feet support the amplifier. Each foot has three small soft half-domes at the bottom to provided isolation. When I received the amp, I had not been told its price. After seeing it, an audio buddy who is a hi-fi dealer estimated the price would be over $10,000. Imagine how surprised I was to learn its $2200! The only way JE Audio can even produce the casework for that amount is to have it made in China, but far be it for me to object to a bargain. Of course, its a bargain only if the VS70 actually sounds as good as it looks, which I will explore below. After liberating the VS70 from its well-packed box, I noted that the tubes had been shipped installed in their sockets. Normally thats a bad idea. If a tube comes out and breaks, it could be a real mess, not to mention dangerous to whoever unpacks the unit. But the VS70s ceramic tube sockets maintained a death grip on the tubes, so none came loose. Still, I checked each tube and made sure it was firmly seated before I connected the amp and turned it on. I placed the amplifier on a homemade amp stand: a 3"-thick butcher-block cutting board sitting on top of four massive Mapleshade cones. I used Clarity Cables balanced interconnect and speaker cables after trying several others in my cable arsenal. This is one amp that definitely benefits from break-in. Out of the box it sounded glassy and congested, but after 50 hours of play it began to loosen up and sound relaxed and inviting. It continued to improve for the next 50 hours. Break-in was drawn out considerably by the manufacturers prohibition against running the amplifier more than four hours at a time. JE Audio contends that this playing limitation is needed to prolong the life of the output tubes. Im used to playing an amplifier all day long, so I found the limitation very restrictive, although I attempted to comply with the manufacturers wishes. No power cord came with the VS70, so I tried several I had on hand. Most audiophiles will toss the computer-grade power cord that comes with most amplifiers and use a third-party cord anyway. The Clarity Cables Vortex seemed to give good results. Most of the audio systems Ive seen and heard in the past several years had only one source, so I did most of my listening with my CD player connected to the VS70s balanced input, using the volume control on the VS70. I also used the amplifier with two different preamps -- after all, JE Audio bills the VS70 as a power amp. First up was my Audio Research LS26, but I found the direct feed to have more impact and detail -- no surprise there. JE Audio also sent me one of its VL10 preamps to use, and it sounded great with the VS70 -- perhaps a bit more dynamic than the LS26, though with a smidgen less bass extension. Still, I preferred no preamp to either of those I used with the VS70. Both preamps are completely balanced units using 6H30 tubes. The LS26 uses two of them in a hybrid circuit that also includes JFETs, while the VL10 uses six 6H30s in an all-tube circuit. There was more to consider. About halfway through the review period, John Lam, president of JE Audio, informed me that he had discovered that Gold Lion KT77 tubes sounded much better in the VS70 than the EL34s and that a set was on the way. These tubes, a $120 option, turned out to be new-production Russian KT77s, not the rare British Genalex new-old-stock tubes that would cost nearly $300 each today -- if you could even find them. The KT77 is a direct replacement for the EL34, so no circuit changes were needed; however, I had to rebias the amplifier for the new tubes. Setting the bias turned out to be quite easy, thanks in part to the extremely clear instructions in the nicely done manual. You must stand the amplifier on its side so you can reach the controls on the bottom. I worried that since the sides of the amplifier sloped slightly towards the top, the amplifier might tip over, but it didnt. The improvement made by the KT77s was not subtle, affording more detail and definition - easily worth the minor additional cost. Thus, the listening impressions I describe below were derived almost completely with the KT77 tubes installed. The VS70 displayed well-defined, finely scaled dynamics, with excellent delineation between small changes in volume level. Not only were dynamics painted with great detail, the shifts in volume were also fast and agile, so musical tempos moved forward with considerable momentum. Reviewers often blather about the pace, rhythm, and timing of a component, and weve even coined an acronym for it: PRaT. I think the source component is ultimately responsible for good PRaT; after all, if its not retrieved from the CD or LP, PRaT cant be injected into the sound later, and music will seem to just drag on and on. However, dynamically sluggish amplifiers and preamps can definitely harm PRaT if they sap energy from the recording. The VS70 doesnt do that. If I had to pick nits, however, and find something to quibble about, I might observe that the VS70 compressed the very loudest volume swings just a smidgen. On Eric Mongrains CD Fates (Prophase Music MVDA4585), "PercusienFa," Mongrain uses his guitar as a percussion instrument, and its dynamic impact can be scary. The VS70 largely did justice to the recording, although the startle factor was a bit less than Ive heard with other amps. Like most horn speakers the MaxxHorn Luminations are capable of very wide, very fast dynamic swings, so there was no reason to think the speaker was the limiting factor. Power amplifiers  Atma-Sphere S-30 Mk III. Preamplifier  Audio Research LS26, JE Audio VL10. The VS70 produced a gloriously wide-open soundstage. Both depth and width were displayed in good measure, with unusually precise placement of musicians. While some of the credit for that must go to the MaxxHorn speakers, they cant reproduce a soundstage if the amplifier doesnt produce one. A Sei Voces recording of Allegris "Miserere" on Allegri Miserere (Astr�e E 8524) had a better-defined dimension of depth than I usually hear, illuminating a vivid picture of the recording venue. The soprano range of this recording seemed just ever-so-slightly polite, which for this somewhat bright recording was actually an advantage. Still, when the soprano wailed out the baroque ornamentation that distinguishes this recording, her voice soared over the rest of the group with effortless strength. EL34s have a reputation for being midrange-centric, but even before the KT77s arrived, the VS70 exhibited extended bass and treble as well. The KT77s were at least as good in this respect. On Chris Joness "God Moves on the Water" from his CD Roadhouses and Automobiles, (Stockfisch SFR 357.6027.2), the bass was weighty, and while not quite the deepest bass Ive heard, it was no slouch. On Jennifer Warnes "The Panther," from the CD layer of her SACD The Well (Cisco SCD 2034), the collection of chimes and other percussion instruments that open the song and appear throughout were well defined and displayed notable treble extension. Both male and female voices were as clean as a whistle. I could hear every detail of pronunciation and vocal inflection. Did the VS70 live up to the EL34s reputation for an exceptionally sweet midrange? Yes, it did, and the KT77s retained much of the EL34s tonal characteristic. However, the KT77s had a less colored, less euphonic presentation whose improved neutrality was clearly more accurate. Some components fake detail by jacking up the treble response, but, if anything, the VS70 had a slightly polite treble, so the detail it conveyed was genuine. It took the form of finer musical textures and more realistic instrumental tonality, as well as portraying instrumental and vocal information accurately. Rated at 30Wpc, the $3750 Atma-Sphere S-30 Mk III makes an interesting comparison for the VS70. Like the VS70, the S-30 Mk III is a push-pull amp that uses balanced circuitry throughout. Thats where the similarities end, though. The Atma-Sphere amp uses triode tubes in an output-transformerless (OTL) output stage. Thats right -- there is no output transformer. This means there should be no bandwidth limiting in the bass and treble, and the playback should be ultra-detailed. With 16 tubes laid out in a classic tubes-in-front, transformers-in-back (there are two power transformers) arrangement, the black crackle-finished Atma-Sphere amp looks like a prop from a 1950s science-fiction movie. Of course, because the Atma-Sphere amp has no volume control, it must be used with a preamp. I paired it with the Audio Research LS26 ($5995), which has proved to be a good mate for the S-30 Mk III and other amps. The Atma-Sphere/Audio Research combination had greater slam and presented even more detail than the VS70. Dynamics had the same fine-grain detail as the VS70, but with more headroom on loudest volumes. Still, on Eva Cassidys new Somewhere CD (Blix Street G2-10090), I actually preferred the pure, direct, and oh-so-sweet sound of the VS70 with its KT77 tubes. On boisterous symphonic music, the Atma-Sphere/Audio Research combination had an advantage, but, of course, there was a great price differential. The JE Audio VS70 is not just the best-looking amp that has crossed my threshold -- its one of the most beautiful Ive seen anywhere. However, this and all other design considerations like its fully balanced circuitry and "chimney" to aid in tube cooling would be irrelevant if the VS70 didnt sound good. Fortunately, it provided superb performance, excelling in rendering dynamics and rhythmic drive, and providing a sweet midrange along with extended bass and treble. Adding to its functionality, the VS70 can be used with either balanced or unbalanced inputs, either by itself (for a single-source system) or with a preamp for more flexibility and remote control. Replacing the tubes wont cost an arm and a leg, and the well-written manual will step you unambiguously through the simple biasing process. Whatever shortcomings I found were extremely minor and evident only in comparison with a much more expensive amplifier and preamplifier. 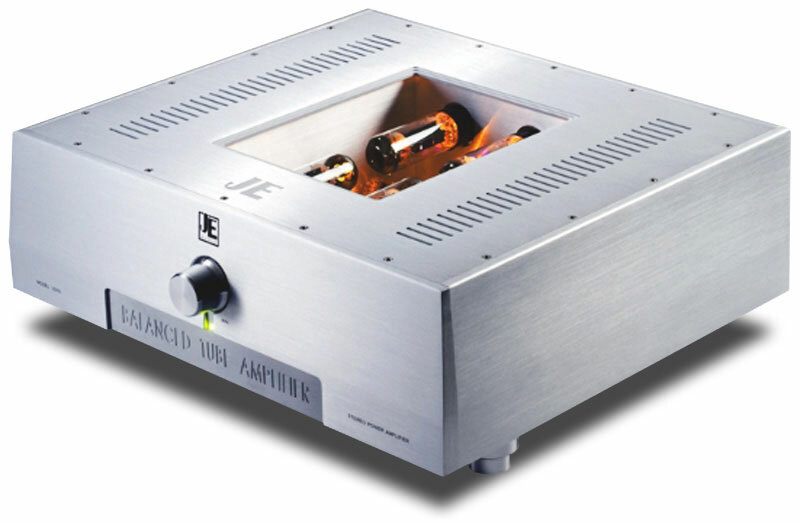 At its $2200 price ($2320 with KT77 tubes), the VS70 has to be considered an outright bargain. And while my over-five-times-as-expensive reference system sounded a bit better in some respects, it surely didnt sound five times better. While VS70s sound had vestigial similarities to the venerable Dynaco Stereo 70 (that midrange sweetness), overall it had a much more neutral and detailed presentation, as you would expect with a modern amplifier design. Great looks, great sound and great price -- what more can you ask for? Price: $2200 USD; KT77 tubes add $120. Warranty: Three years parts and labor, 90 days for tubes.